The extended mission at Ceres additionally allows Dawn to be in orbit while the dwarf planet goes through perihelion, its closest approach to the Sun, which will occur in April 2018. At closer proximity to the Sun, more ice on Ceres' surface may turn to water vapor, which may in turn contribute to the weak transient atmosphere detected by the European Space Agency's Herschel Space Observatory before Dawn's arrival. 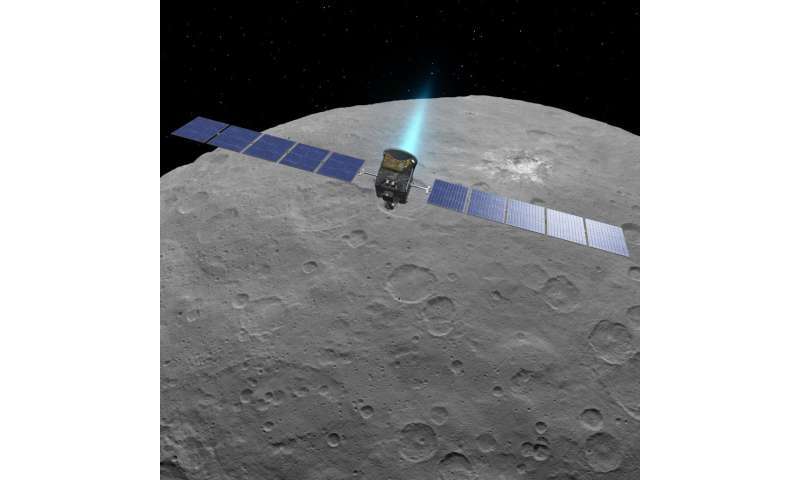 Building on Dawn's findings, the team has hypothesized that water vapor may be produced in part from energetic particles from the Sun interacting with ice in Ceres' shallow surface.Scientists will combine data from ground-based observatories with Dawn's observations to further study these phenomena as Ceres approaches perihelion. In 2015 Dawn moved closer down to Ceres. In 2016, it moved up to higher orbits. Now in 2017, it's going back down toward Ceres? These manuevers don't seem to carried out very effeciently or with a long-term plan in mind. What, you got something against the Hokey Pokey?? There was no guarantee the mission would be extended or Dawn would continue functioning, so it covered high and low orbit objectives. Now, with the extension, it is going back in - even lower. This made possible by the fuel stingy ion drive. They managed to get extra science out of it because they were stingy with the fuel and you think that's a Bad Thing? What I find most amusing is that republicant libertardian whiners complain when someone manages to extend a mission because they did a good job. This is typical republicant libertardian whiner juice. And it's bitter. Sounds like the republicant libertardian whiners can't do THEIR job. And hope to cover it up by whining. Getting extra science is bonus. Whining about it is bogus. Get over it, @Fart_A. This is absolutely a good decision which, when I was regularly following Dawn's progress, seemed only a pipe-dream. The lower part of the planned elliptical orbit will enable the spacecraft to gather new, or more accurate, information on the composition of the surface and near-surface layers. Which translates to more information on how the solar system, and the bodies within it, formed. I'm so surprised they still have sufficient hydrazine on board after such a long and complex mission - full marks to the Dawn team for such incredibly efficient management of resources! In 2015 Dawn moved closer down to Ceres. In 2016, it moved up to higher orbits. Now in 2017, it's going back down toward Ceres? These manuevers don't seem to carried out very effeciently [sic] or with a long-term plan in mind. You very evidently have not been keeping up - go and do some online research and find out just how amazing the Dawn mission has been and, in particular, to understand the careful reasoning behind the different orbits achieved by Dawn around Ceres. Without doing that, your remarks just make you look foolish - is that really how you want to be seen? Beside the chemical analysis, higher res pictures of the structures some degrees off the Occator "white spot" or the Ahuna Mons mountain will make it to global MSN which is always good for NASA. 120 miles (200 kilometers) from the surface of Ceres at closest approach. Previously, Dawn's lowest altitude was 240 miles (385 kilometers). 200=193 | 385=386 I know, petty..
What I find most amusing is that republican . . . did a good job. This is typical . . . whiners can't do THEIR job. And hope to cover it up by whining. I'm right of Genghis Khan, I'm all about mission extensions. Did it ever occur to you that people being wrong does not make them defective? Science is all about trial and error. Those unwilling to err will never venture a testable hypothesis. Name-calling and mocking someone for a wrong-headed idea is the hallmark of religion, not science. Please take it elsewhere.